Remove the generic strings attached by the manufacturer and replace with strings of your choice. Since tone is not important, I recommend using old discarded strings from your instrument; they work fine and the touch on your finger tips will feel more like your instrument. The string height on the Fingerboard is intentionally high for customizing to individual preferences. 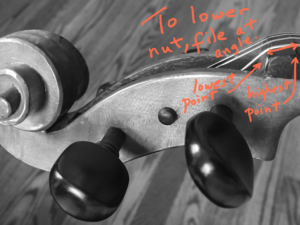 If it is uncomfortable, loosen the strings and individually file a slightly deeper groove in the nut and bridge. Go slowly, file in small stages to make sure the height does not get too low. 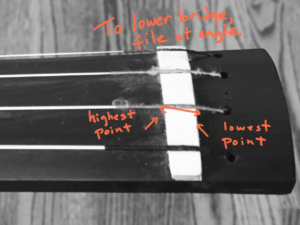 Please review the pictures before filing…file at an angle to prevent string buzzes. As with all violins and violas, occasionally pegs slip or stick during climate changes. Unwind the string and use some chalk or rosin on the peg to keep it from slipping. If the peg is too stiff, use a compound such as “peg dope.” Do not force the pegs as they are not as durable as pegs on fine instruments.